Xerox Cedar "Viewers Window Package"
I just want to add a little bit about the Xerox Cedar "Viewers Window Package" environment. Cedar is a programming language based on Mesa, with some similarities to Smalltalk. 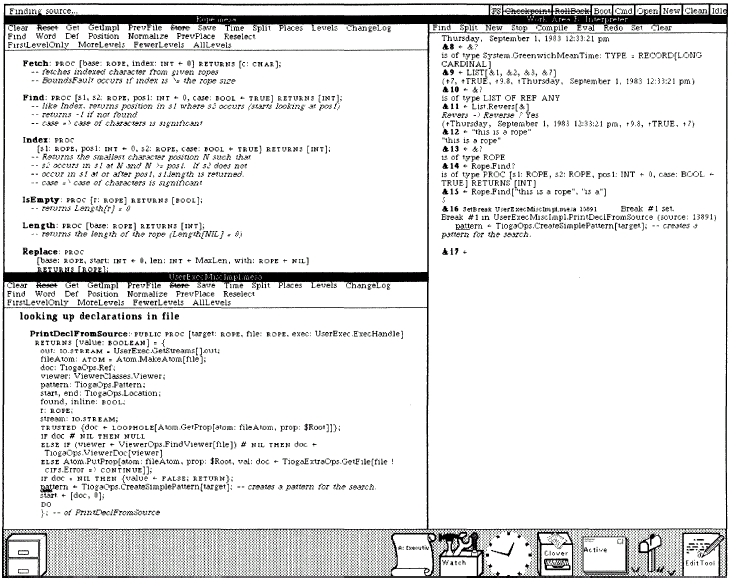 Sort of like Mesa and Smalltalk, Cedar is another all-in-one programming environment and GUI with a focus on documents. 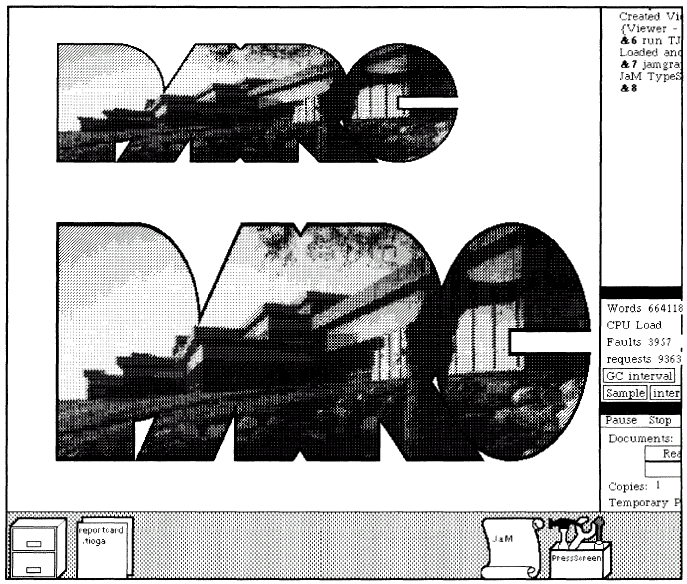 It was developed at Xerox Parc after the Xerox Star, but as far as I can tell this was never used commercially. It was first "put to use" in 1982, and these screen photos seem to be from 1983. These provide much, much more detail about the system, applications, and programming language. 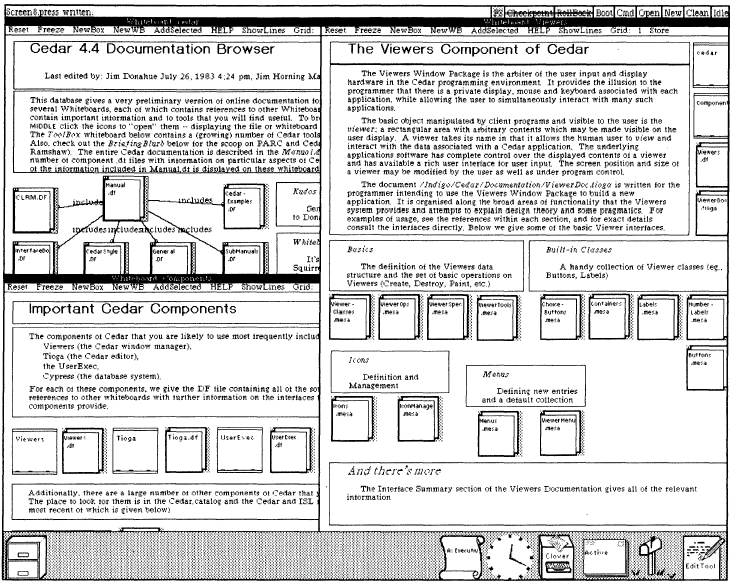 Youtube also has a video about Cedar Documents as User Interfaces. Cedar ran on the Xerox Dorado systems - a faster high-end development workstation that followed the Alto. 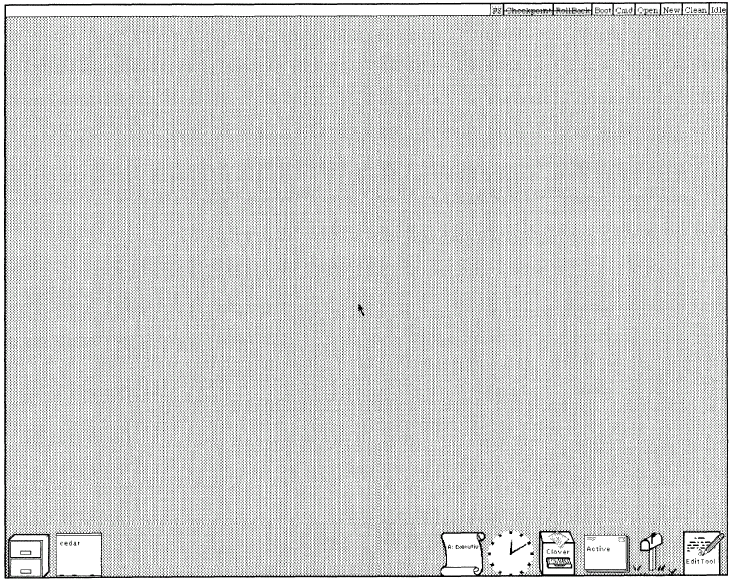 The screen display was very high resolution for the time, slightly exceeding 1024x768. This shows the clock and FileTool. The most notable thing is that this looks a heck of a lot like Microsoft Windows 1.0. Even more so if you compare it to the 1983 Comdex preview. 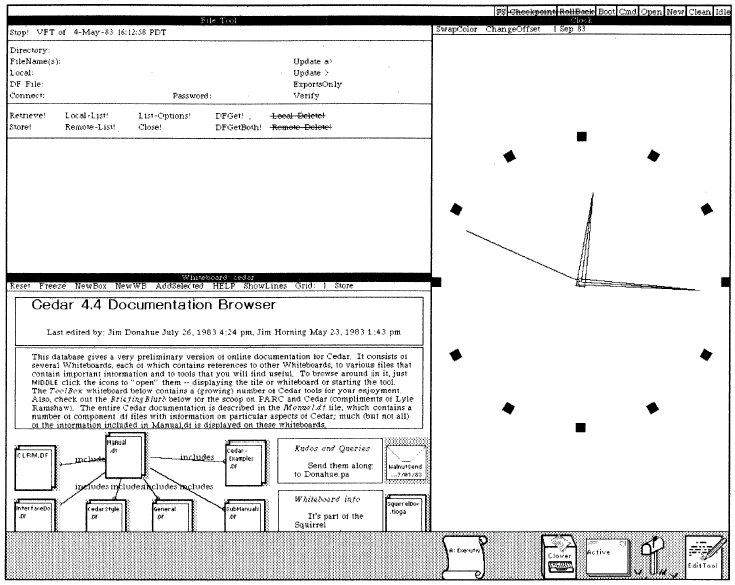 This included tiling window management, a dedicated icon area at the bottom, a scalable clock, a message area at the top, and some applications have many menu items in their menu bar. This shows an additional application, the documentation browser, open in another tile. 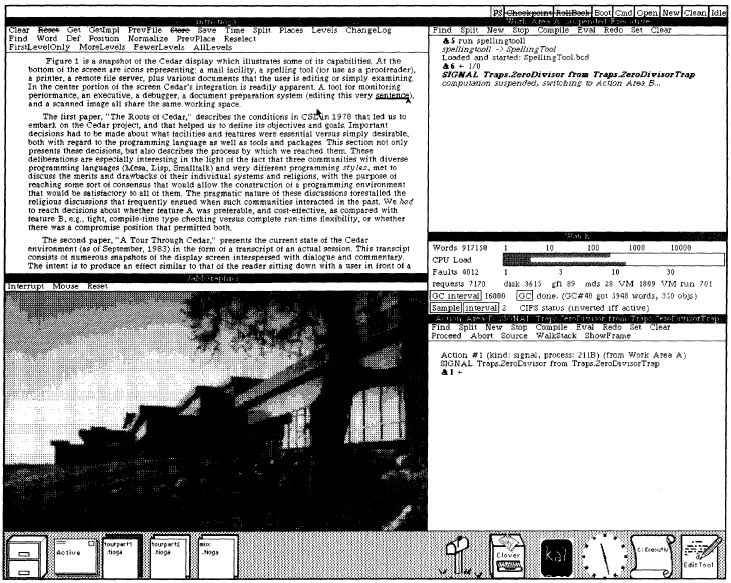 As the mouse moves over a window's caption bar, it changes to reveal the window management options. Of course, being from Xerox, the entire thing revolves around documents. The document system is very powerful and blurs the lines between documents and programming. "The above snapshot of the Cedar display illustrates some of Cedar's capabilities. At the bottom of the screen are icons representing: a mail facility, a spelling tool (for use as a proofreader), a printer, a remote file server, plus various documents that the user is editing or simply examining. In the center portion of the screen Cedar's integration is readily apparent. A tool for monitoring performance, an executive, a debugger, a document preparation system (editing this very sentence), and a scanned image all share the same working space." Most of the Cedar document above focuses on the programming language. Both the language and the development interface are integrated in to this environment. Although part of the programming tools, it includes an icon editor. Interestingly, the documentation describes how the system can use network Remote Procedure Calls (RPC). This was fairly new, and drastically decreased the amount of development time needed to make distributed applications. The above is supposed to be a game using RPC to communicate with other clients. RPC is an interesting idea as it enables applications to run locally on each computer while passing minimal information over a network where another machine processes it. This way, each application or service does not have to implement its own protocol. This is another thing Microsoft eventually adopted in their Windows NT products. 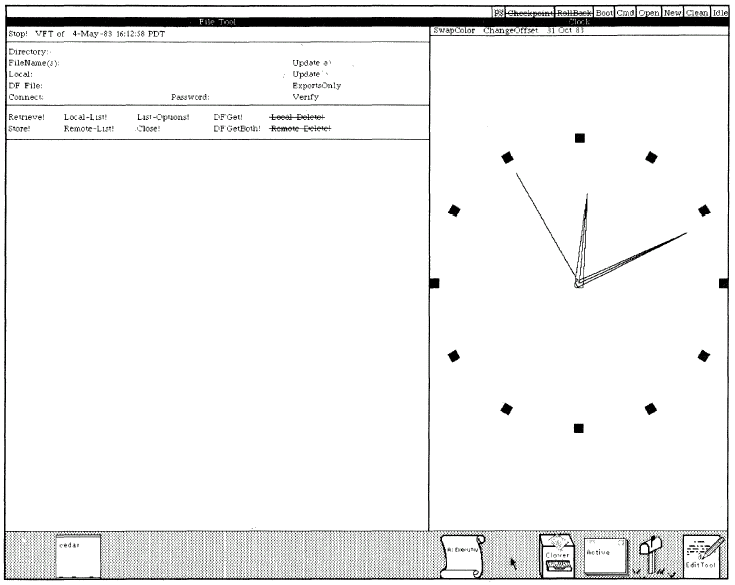 In Windows NT, Microsoft heavily used RPC in their remote management tools. This way an administrator could use a single application running on a single computer to manage accounts, shares, and system configuration without having to remote control the remote user's GUI or use hacky scripting. Although, it can be a security nightmare. 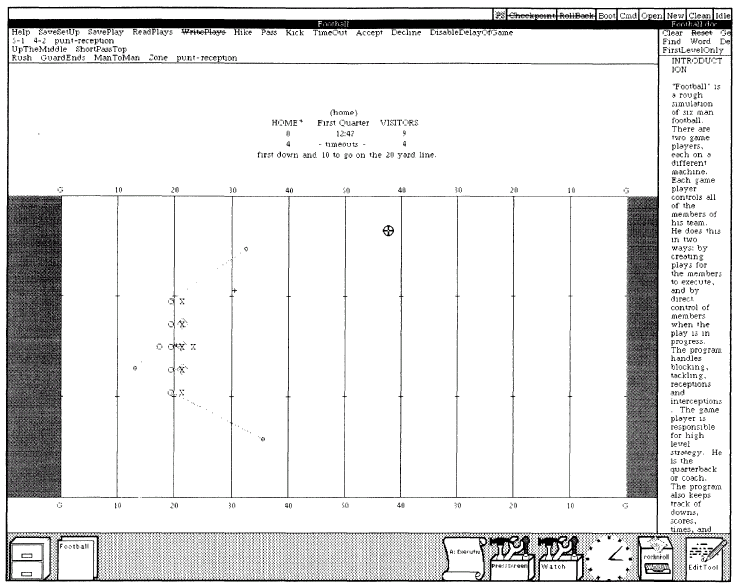 In conclusion, Microsoft stole a lot of people from Xerox Parc. Clearly there was much influence directly from this system in the Windows product.